"The sea water level has risen by 9m (29ft) and has destroyed the Mukalla seafront," resident Mohammed Ba Zuhair told the Reuters news agency. It's not easy to find what is happening right now. The news from most outlets is several hours old, and I gather that a lot of the area that's hardest hit is Al Quaeda territory. 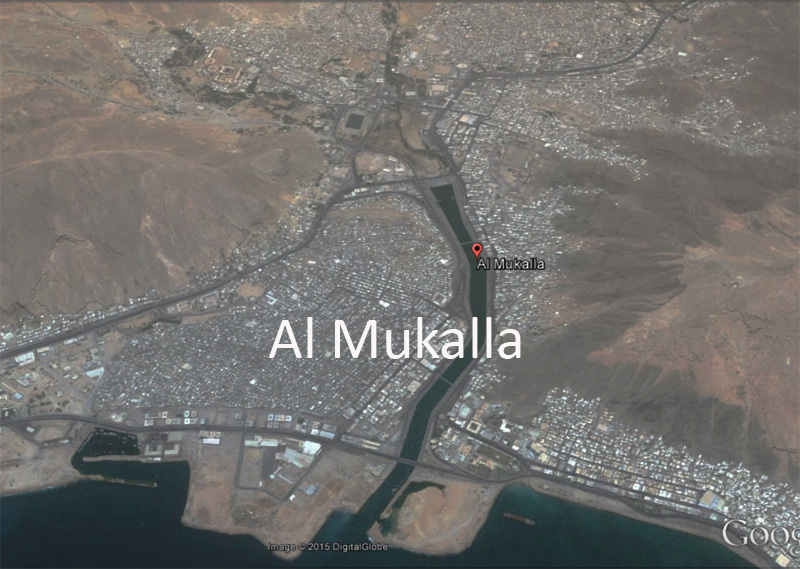 And here is an image from Google Earth, showing why, even though it's not directly in the path of the eye of the storm, Al Makulla is especially vulnerable to the associated downpour. It is sandwiched between steep hills on both sides, so water will pour down, making the actual heavy rain all the worse. The parched Yemen coast is nearly devoid of population centers, but Chapala is aiming for one of them. The forecast track from the Joint Typhoon Warning Center as of 10:00 am EST Monday (7:00 pm Yemen time), in close agreement with the scant model guidance available, brings Chapala into the coast about 50 miles south of Mukalla (also Al Mukallah) on Tuesday night local time, putting that city of 300,000 on the more dangerous right-hand side of the cyclone. The potential storm surge will be tempered somewhat by the steep rise of the undersea topography just offshore, but this region’s experience with any surge is very limited. According to a review paper by storm surge expert Hal Needham, there are only four observations in the scientific literature of storm surge or storm tide in the Arabian Sea. The only other hurricane-strength cyclone in modern records to affect the Arabian Peninsula is 2007’s Cyclone Gonu, which nicked the southeast corner of the peninsula en route to Iran. Water levels during Gonu reached 5 meters (16 feet) at Ras al-Hadd, Oman, although that total may include waves as well as storm surge. We can only hope that people find safety, and that they are able to get what is needed to recover from the devastation this rare storm is bringing. Update: Andrew Freedman now has an article on Mashable that provides some more details. Andrew Freedman now has an article on Mashable that provides some more details. It's a rat race. Invest 95A just got born. Under the influence of an upper air cyclonic circulation over east central Arabian Sea off Karnataka coast, a low pressure area has formed over east central & adjoining southeast Arabian Sea. Associated upper air cyclonic circulation extends up to 3.1 km above mean sea level. The system would become well marked low pressure area during next 24 hours. cRR, the word from my Dutch relatives is that there are all sorts of new records being set there - are you able to summarise? It's somewhat serendipitous that I heard about this, and about the AMS's latest report - just yesterday I was thinking that there's probably a niche for a blog dedicated to quantitatively and comprehensively tracking the increase of extreme weather events related to global warming. One that allows anyone to rapidly compare recent periods with historic ones, with respect to all the unfolding insanity that is just the tip of a planet-sized, millenia-sized behemoth. Unless there's one already and I've missed it?